UCF looked to keep their winning streak alive against a very good Temple defense. The game was a shoot-out right off the back. Temple won the coin toss and chose to receive. The first play of the game was big run from Temple running back Ryquell Armstead for 34 yards. That momentum was stopped by the defense and they held Temple to a 41-yard field goal by Will Mobley giving them an early 3-0 lead. The ensuing drive for the Knights was all Adrian Killins. He returned the kick for 36 yards then on the next play Killins took off for 28. That drive was cut short and the Knights elected to kick a field goal that was blocked by the Owls. On the Knights, next drive on offense Milton hit Greg Davis on two back to back big plays. The first for 34 and the second for 29. Milton capped off the drive on the next play hitting Snelson in the corner of the end zone for a 19-yard touchdown reception giving the Knights the lead 7-3 after a Matthew Wright extra point. The Owls answered right back. Quarterback Anthony Russo hit Chris Myarick for 24 yards and then they converted on a 3rd and 16 on a Russo to Yancy Broderick 17 –yard reception. Russo hit Branden Mack on the next play for an 18-yard touchdown pass giving them the lead back at 10-7. The Knights offense stayed hot with three of their running backs Killins, McCrae, and McGowan leading UCF into Temple territory. After a big pass interference call in the end zone on Temple, Milton hit his favorite tight end Michael Colubiale for a 9-yard touchdown pass. This put them back up 14-10. Temple answered yet again on the next drive when Russo hit Randle Jones for a 70-yard touchdown pass, quickly putting the owls back on top 17-14. The Knights were then forced to punt after Milton uncharacteristically miss Tre Nixon twice deep. Temple got the ball back and drove down the field as Russo hit Bryant for 32 yards and then Branden Mack for 25, putting them into UCF territory once again to end the first quarter. UCF’s defense held the Owls twice in the red zone. The first time they held them to a field goal but were penalized for running into the kicker giving Temple another chance for 6. The Knights D stopped them again holding them to another field goal. This field goal was faked and quarterback Anthony Russo ran it in for a 5- yard touchdown. After the extra point temple extended their lead to 24-14. The shootout continued as Milton hit Snelson on the next drive for 57 yards followed by a 13-yard reception to Nixon. The Knights got pushed to 4th down and went for it. Milton took it himself for a 1-yard touchdown run decreasing temples lead to 24-21. Temples run game on the ensuing possession got them all the way deep into UCF territory but the Knights defense stayed strong and held them to a Mobley 21-yard field goal making the score 27-21. UCF was forced to punt on the next possession but the defense came out and forced a quick 3 and out on Temple. UCF’s offense took advantage. McCrae had a big rush for 19 yards followed later by a 11-yard rush to the one yard line by Marion Williams. The big back for the Knights #4 Tosh McGowan punched the ball in for a 1-yard touchdown run giving them the lead once again 28-27. Temple was not going into the half without a fight. Russo marched the Owls down field with two big rushes back to back one for 12 the next for 16. Russo ended the drive on a 15-yard touchdown pass to Bryant giving them the lead 34-28 going into half. The Knights came out hot in the third quarter. They fed running back Greg McCrae. He had 3 carries back to back to back. The first two for 17 yards and the third for 32 yards which he took to the house. This gave UCF the lead back at 35-34 after another good extra point from Wright. Both teams punted on their next possessions. When the Knights got the ball back Killins started the drive with a big 15-yard reception. Then they fed McCrae again on a 9 yard and 10-yard rush. Milton then hit Colubiale on an acrobatic pass for a 19-yard touchdown increasing their lead to 42-34. The Knights defense gave up no points in the third quarter for the 5th time this year. They came out hard in the 4th quarter stopping temple once again deep in UCF territory. Temple was forced to kick a 40-yard field goal that Mobley missed giving the Knights the ball back. The Knights were driving until Milton was picked off by safety Delvon Randall. That pick led to points for Temple. The owls got into UCF territory and were forced to a 4th and 3 that they converted on. Russo then hit Bryant for an 8-yard touchdown pass that they went for 2 on and didn’t convert. Temple inched closer at 42-40. UCF’s offense answered on the next possession. Milton hit Marion Williams for a 19-yard reception, followed by a McCrae 14-yard rush, then a 12-yard reception to Killins. The drive was put away by McGowan on a 10-yard touchdown run. Wright’s extra point made the lead 49-40. Temple got the ball back and drove down the field once again with a couple of big throws from Russo. Trysten Hill stopped that momentum by sacking Russo forcing a 4th and 20 that the Owls went for and couldn’t convert. They turned the ball back over to Milton and the offense. McCrae continued to ball as he took off for 12 yards and then another rush for 40 after breaking a few tackles. The Knights let the clock run as they brought out Matthew Wright for a 32-yard field goal that he buried making the game now out of reach at 52-40 with a 1:36 left. 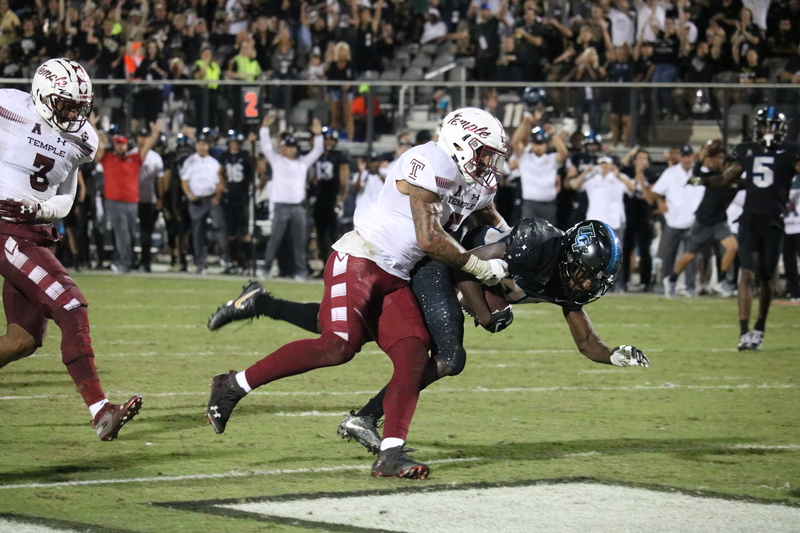 UCF keeps their 21-game winning streak alive as they took down a tough opponent in Temple 52-40. The Knights were led by running back Greg McCrae who finished the game with 188 rushing yards. As the Knights move to 8-0 on the year they will look to keep this momentum going next week against another tough AAC opponent in Navy on homecoming week.